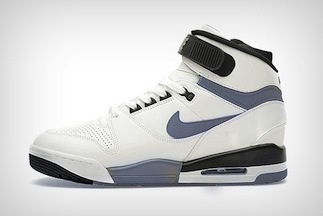 …in the shape of the original Nike Air Basketball shoe, the first with the visible Nike Air unit. The revolution definitely continues 25 years after their original release and to mark that milestone Nike are bringing back the revolution in some OG flavours and some new and fresh remixes. I am hoping that these do not disappoint and that the materials are on point. I have picked the ones I’m feeling but there’s some other colourways coming too and some using different materials such as suede on the uppers. So what have we got here? For the purists there’s the tech grey OG makeup, I am not sure if that colourway has seen a retro before. It unfortunately gets Nike’s VNTG treatment and so has some fake yellowing in places – please Nike leave that alone, the kicks’ll go yellow and blue too from denim bleed all on their own! 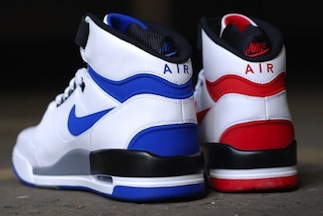 And then there’s the OG red and blue. I love the blues but I’m glad they brought back the reds. You may remember the reds Spike Lee’s Do the Right Thing, rocked hard by Radio Raheem. Get your ghetto blasters out!!! So plenty for you OG lovers with these Revolutions. As for something new I am loving the Air Assault remix. I copped a couple pairs of retro assaults, my favourites being the yellow ones, when they were released a couple of years back and I love this fresh remix. Good good stuff from Nike. Not sure when the greys are hitting the UK, these were due for a release a couple days ago at Overkill in Berlin as part of a Vintage pack that included the Air Trainer SC High and the Air Trainer SC 2. The Overkill website says COMING SOON so not sure whether the release was delayed. No confirmed date on the reds, blues and the safaris but we’ll keep you posted. Worry not, the revolution cometh!!! 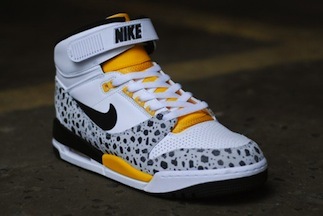 Shouts to http://www.sneakersaddict.com and http://www.freshnessmag.com for the pics – BIG UP!